Adriana with her big sign and fab shirt at Paul's Stockholm concert. Today we have another fan story! This time all the way from Slovakia! 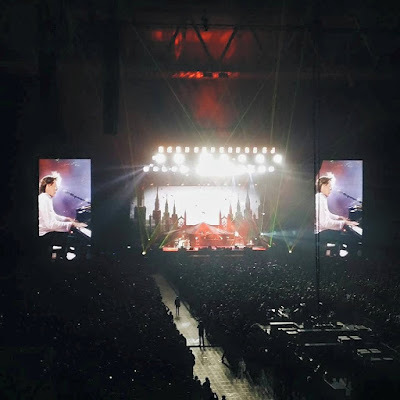 We are excited to welcome Adriana Tabisova on the blog with her story of going to see Paul McCartney in Stockholm, Sweden. Adriana is 16 and is a huge fan of the Beatles and is also Slovakia's Ambassador to The Beatles Story Museum in Liverpool! So, we have a VIP on the blog today! Hello! I'm Adriana from Slovakia. I'm 16 years old and I'm a huge fan of The Beatles. I'd like to tell you my story that I've experienced recently! I'm very lucky to say I've experienced one of the Out There tour concerts. I went (actually flew) to the one in Stockholm, Sweden which is more than a thousand miles from my home in Slovakia, but it was certainly worth it! 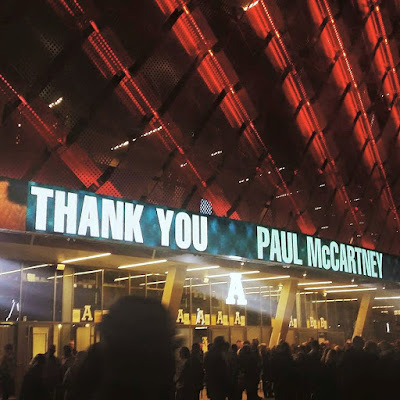 This was the second time I've been to see Sir Paul and I knew this time I had to do something more than just go to his concert. I wanted to meet him. I started to look for blogs and videos giving advice on how it would be possible to meet Paul, but I thought all the people that met Paul were just pretty lucky and it wouldn't happen to me. 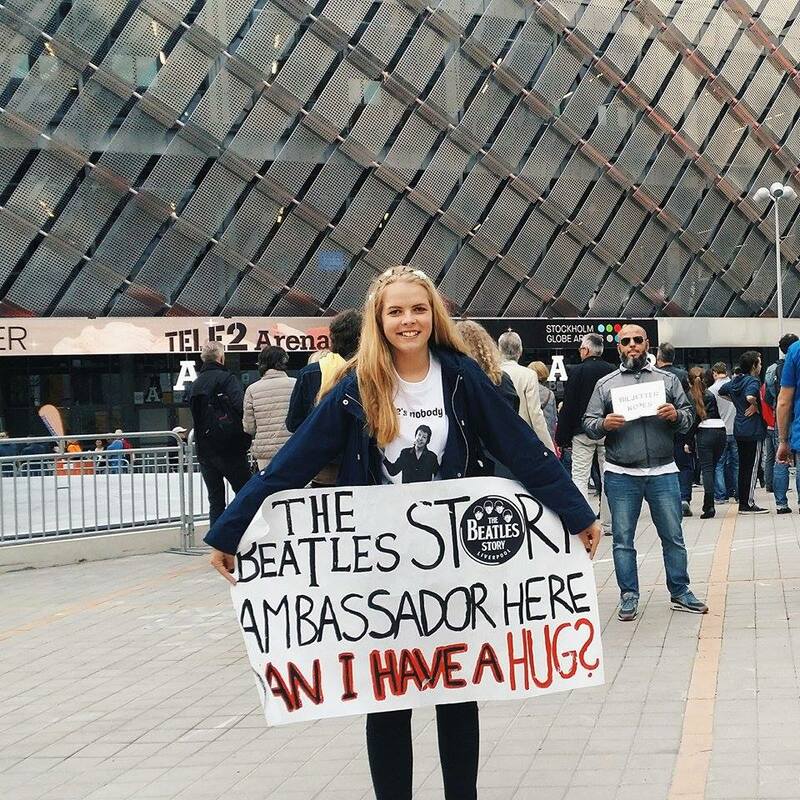 I made a huge sign saying "The Beatles Story Ambassador Here, CAN I HAVE A HUG?'' because I was hoping Paul would call me on the stage as he does to many people. Adriana gets excited to see Paul in Stockholm. I'm an Ambassador for the Beatles Story in Liverpool for my country, Slovakia, so I thought that may be a reason he would invite me on the stage. I messaged Brian Ray (Paul's guitarist), thinking there's no chance he would get back to me. But he did! I almost fainted! He told me Paul usually comes at 4.30 - 5.00 pm to the arena for sound check and I should be there and wait for him if I want to see him. Brian is such a nice guy! So I went there pretty early. There were a few people in front of the arena and I didn't give great odds to it. I also had no idea where to go. Then I asked a nice security guy if he knows where should I go to see Paul and he told me to go behind the arena! So I ran there like crazy and there were few people wearing Beatles shirts and stuff like that. I tried to ask them if they knew anything but they all had no idea. A few minutes after that, Paul's road manager came and he told us to go a bit further. Nobody trusted him, they thought he was shoo-ing us away! but I knew who he was, I'd read about him on the blogs, he is a such a nice guy and you should trust him if you want to see Paul drive in. So I did and I started to really think that something unforgettable was going to happen! We waited there for maybe an hour which isn't that long and then Paul came! He drove past! It was only a few seconds, but it was precious! He sent us air kisses, he played air bass (his typical gesture), waved at us, smiled and he was so nice! We all screamed, shouted 'I love you Paul' and 'Thank you'. Adriana waves at Paul during his drive into the venue. It was just amazing. If you're ever going to Paul's concert, just do this! You will never forget it! I can't even describe how I felt. I know that you understand it well! Who else if not you? Then, full of euphoria, I went to the concert. I found the playlist of the concert before I went there, but Paul changed it quite a lot and I really liked that. He added 'One After 909', 'Got To Get You Into My Life' and many other songs I love! He told us funny stories, he was in such a great mood, dancing, joking and all the other stuff I'm sure you know about when you've seen Paul. I realised how much his music connects people, although it's kind of sad that people only scream when he starts to play 'Hey Jude' or 'Let It Be', but on the other side, it's so nice to realise that everyone loves that song and thousands of people sing it together! Adriana's view of the stage. I cried a lot when he played 'Maybe I'm Amazed' (I adore Linda), 'Here Today' (This doesn't need any words), 'Something' (Same with this one), 'The Long and Winding Road', 'Band on The Run' (The best song Paul has ever written, in my opinion! ), and during 'Golden Slumbers/Carry That Weight/ The End' because these songs are very extraordinary for me! But I also felt like crying the whole concert! 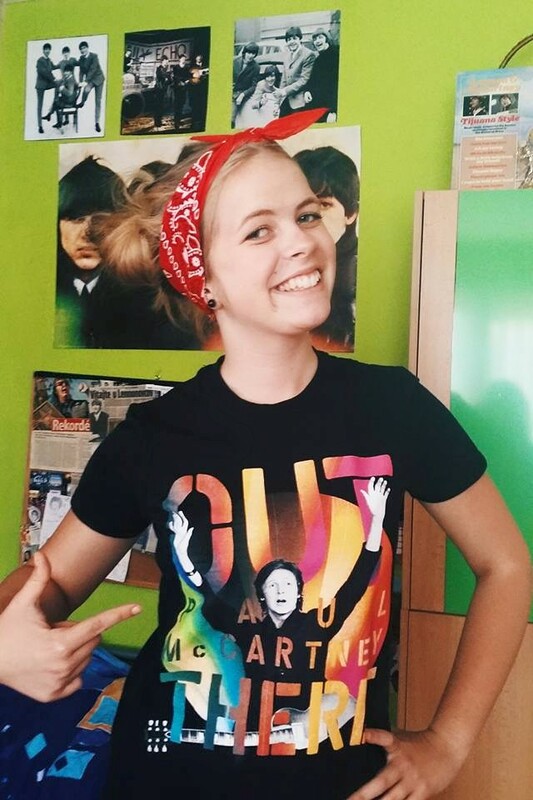 It's just so wonderful to see Paul McCartney! The thing with my sign didn't work out, but he didn't invite anyone on the stage. 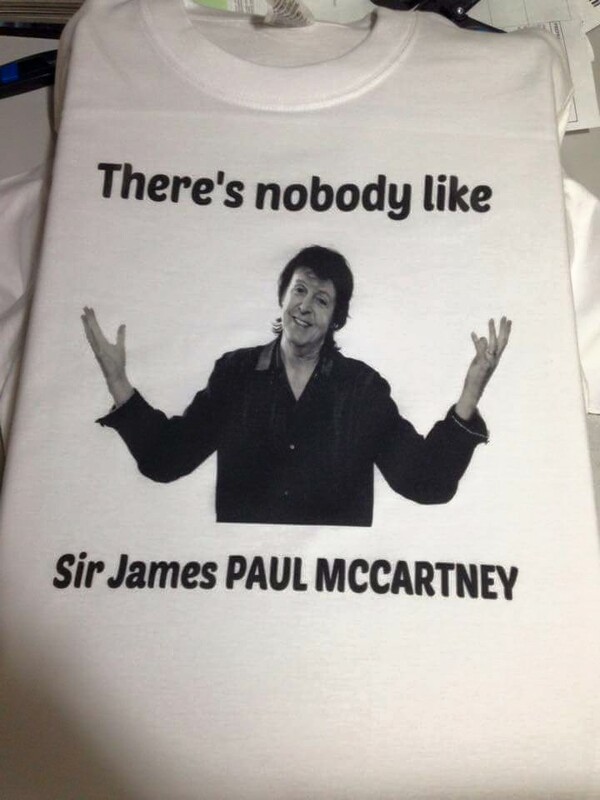 I then realised I don't really know if this is the way I would like to meet Paul anyway. I mean, it would be really cool, but if I had the choice, I think I would prefer to just personally tell him big THANK YOU when there was no one else around. But this doesn't happen every day. Anyway, it was a great night, show, great band, people, the best cultural experience of my life and I'm happy to share it with you! 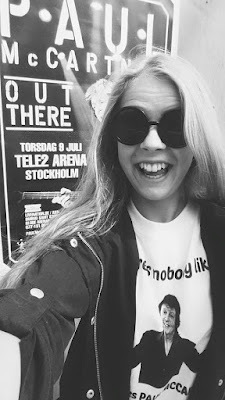 Adriana proudly wears her 'Out There' Tour shirt. We'd like to say a huge thank you to Adriana for telling us her story! Be sure to check her out on Facebook! If you want to tell us your Beatles experience, please get in touch with us!